Prime Minister of Samoa Chair of the Pacific Islands Forum Address at opening P.A.L.M. I bring you warm greetings from the people and Government of the Independent State of Samoa, and acknowledge the recognition of my chairmanship of the Pacific Islands Forum and the related invitation to co-chair with you Honourable Prime Minister Abe, this 8th Pacific Leaders Meeting. Three years have passed since the last P.A.L.M. – and in that time we have seen many significant developments around the world, and closer to home. 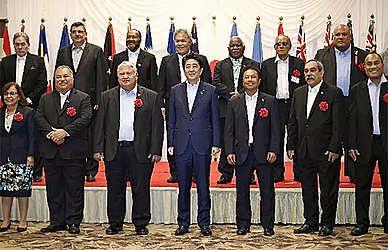 The ongoing fluidity of the global landscape underscores the importance of relationships even partnerships – based on mutual respect and responsibility – and I believe that the PALM is an invaluable mechanism for my fellow Leaders of the Pacific Islands Forum and I, to continue strengthening and deepening our significant relationship with Japan. At the outset let me acknowledge the participation of French Polynesia and New Caledonia to this P.A.L.M. meeting. And to thank you, Prime Minister Abe, for honouring the importance that my fellow Leaders and I place on coming to the P.A.L.M. as the full complement of the Pacific Islands Forum family. From its foundation, the Pacific Islands Forum has recognised the advantages of shared purpose, close cooperation and coordination. We, the Leaders of the Forum, have committed to harnessing our shared strengths to address our common challenges and ensure that our collective engagement brings practical benefits to our Pacific people – the custodians of the world’s largest ocean, its many islands and its rich diversity of cultures. With that said, I am sure we all recognise that our region and the world has reached a critical juncture in history. We see growing recognition of, and interest in, the significance of the Pacific Ocean, and its valuable resources. Alliances are becoming increasingly complex and dynamic. At the same time, the natural environment and the communities of the Pacific are affected more and more by extreme events from natural hazards and from the effects of climate change. With this evolving context in mind, my fellow Leaders and I committed last year – at the Forum Leaders Meeting in Samoa – to the ‘Blue Pacific’. The Blue Pacific represents our collective identity, drawing on our common connection to the Pacific Ocean, and as the largest oceanic continent on our Blue Planet. The Blue Pacific reminds us of our stewardship of the Pacific Ocean. And it reinvigorates our commitment to work together to advance the Leaders’ vision under the Framework for Pacific Regionalism, which is, a Pacific region of peace, harmony, security, social inclusion, and prosperity – so that all Pacific people can lead free, healthy and productive lives. In pursuing our ambitions as the Blue Pacific, we strive for open and genuine relationships, and inclusive and enduring partnerships that recognise and support the collective strength and voice of our Pacific region. As your Pacific partner we would continue to uphold the principles of our Blue Pacific identity that there is strength in unity, a collective voice and actions and we would not shy away from honest dialogue should we face uncertainties or even ambiguities. At the same time, fellow Pacific leaders, let us consolidate our priorities including alignment of country and regional and ensure the delivery mechanisms of our partnerships are genuine and able to address our common goals as inscribed in the Framework for Pacific Regionalism. Japan has been a long-time partner to our countries in the Pacific. Alongside our individual national relations with Japan, we as a region have developed a strong collective relationship with Japan. We acknowledge that Japan was one of the first participants in the Post Forum Dialogue process that the Pacific Islands Forum initiated in 1989. And we continue to deepen our dialogue and cooperation through the P.A.L.M. process which has now been in place for two decades. Today we have the opportunity to advance our dialogue and cooperation in key areas of critical concern to the Pacific. The governance and sustainable management of our Ocean is foremost amongst these. Ensuring the sustainability of our ocean resources, including fisheries, is a vital concern for Forum Leaders. Climate change and disaster risk reduction are also key priorities for our region. The region is taking a global lead in dealing with the policy issues of climate change and disaster resilience through the Framework for Resilient Development in the Pacific and through work underway to develop and establish a Pacific Resilience Facility. This Facility will strengthen our resilience efforts by focusing resilience finance in a way that is relevant to our scale, our capacity and our context – that is proactive in seeking to risk proof new initiatives and retrofit existing assets before extreme events impact us… We look to Japan for continued and deepening support, both political and technical, in climate change and disaster risk reduction. The Pacific region is also committed to the 2030 Development Agenda, S.A.M.O.A. Pathway and our Framework for Pacific Regionalism, as guided through the Pacific Roadmap for Sustainable Development. We see the development of our region’s economic prospects as integral to this. And we look forward to working with Japan in creating and deepening the connections between us – be they through transport, infrastructure, employment, culture, sports or tourism. Let me assure you Prime Minister Abe, when sustainable development becomes reality, self reliance is already assured. As I conclude, I would like to register the interest of the Pacific Islands Forum in hosting the next Ministerial Interim Meeting in the Pacific islands region. We consider that this is an important development, and a way of reinforcing the spirit of partnership, mutual respect and reciprocity that underpins the PALM. Excellencies, colleagues – I look forward to fruitful discussions this morning, to continue to build on and progress our important partnership, and ultimately to achieve our development aspirations that need to be underpinned by resilience, sustainability, equity, peace and prosperity.